Starz tweeted a still photo of Sam Heughan as James Alexander Malcolm MacKenzie Fraser in its upcoming film adaptation of the Diana Gabaldon’s Outlander book series. I think we can all agree that a kilt becomes Sam. STARZ has been busy today in the Outlander casting department. They just announced that Gary Lewis has been cast as Colum MacKenzie in the Diana Gabaldon best-selling book series TV adaptation. Outlander will hit the TV screens on STARZ in 2014. I think Lewis and McTavish will be great as the brothers MacKenzie. They look enough like brothers to pull it off. Now if they would only cast Claire, I would be a happy Outlander Fan. STARZ announced today that actor Graham McTavish was cast as Dougal MacKenzie in the upcoming TV adaptation of Diana Gabaldon’s Outlander series. If you aren’t familiar with the Outlander book series, Dougal MacKenzie is the War Chieftain of Clan MacKenzie, secret supporter of the rebel cause against the British, and uncle to Jamie Fraser. McTavish has had a long career and had roles in many TV shows and films – Lost, NCIS, CSI: Miami, Rambo, Pushing Daisies, Prison Break, 24, Secretariat, and The Hobbit: An Unexpected Journey – just to name a few. He has also done extensive voice work for many video games. Now, if they would only cast Claire, I would be a happy Outlander Fan. STARZ announced that Tobias Menzies has been cast in the roles of Frank Randall and Jonathan “Black Jack” Randall in the upcoming series Outlander. Menzies is best known for his roles in HBO’s Game of Thrones, as the heir to House Tully of Riverrun, Edmure Tully and as Marcus Junius Brutus in HBO’s Rome. Menzies won a film role beside Dame Judy Dench in the 2006 James Bond franchise, Casino Royale. He graduated from the Royal Academy of Dramatic Art (RADA) in 1998 and began his acting career in popular UK series such as Foyle’s War, Midsomer Murders, Dr. Who: Cold War, and Casualty. Menzies is joining Sam Heughan who was recently cast in the role of Jamie Fraser. Outlander is an original series adapted from Diana Gabaldon’s international best-selling books and will premier on STARZ in 2014. The “Outlander” series spans the genres of romance, science fiction, history, and adventure in one epic tale. It follows the story of Claire Randall, a married combat nurse from 1945 who is mysteriously swept back in time to 1743, where she is immediately thrown into an unknown world where her life is threatened. When she is forced to marry Jamie Fraser, a chivalrous and romantic young Scottish warrior, a passionate affair is ignited that tears Claire’s heart between two vastly different men in two irreconcilable lives. Frank Randall is Claire’s 20th century husband and a professional historian with a deep interest in the 18th century and his own genealogy. Frank and Claire are reunited in 1945, after being separated by the war. They are rekindling their relationship when Claire suddenly disappears. Jonathan “Black Jack” Randall is Frank’s ancestor from the 18th century. A Captain in the English Army posted into Scotland during a time when rebellion was rife. The nickname is no mistake; while Black Jack Randall may look striking similar, he is nothing like the gentle, bookish Frank; he is a dark, violent man who will take what he wants at any cost. I think Tobias Menzies will make a fine Frank/Black Jack Randall. He has the look to be an innocuous scholar one minute and an evil black guard a minute later with just the rise of an eyebrow. Now, if they would just cast Claire!! The Outlander fandom is waiting with bated breath. “Oh. My. God. 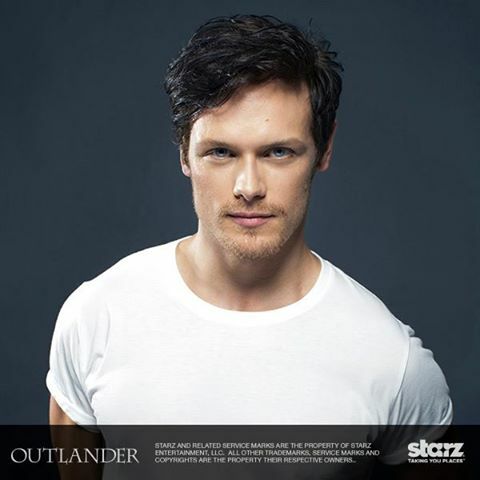 That man is a Scot to the bone and Jamie Fraser to the heart.” – Diana Gabaldon exclaimed. Congratulations, Sam!!! We are looking forward to seeing Our Jamie come alive. Now, let’s see who gets cast as Claire??? The pressure is on to get this right Ronald D. Moore.